This year’s Language Cultural Immersion Tour in Italy with Venice Italian School and Melissa Muldoon (aka Studentessa Matta) just wrapped up and I have just returned home after spending 10 days in Venice with a great group of language learners. 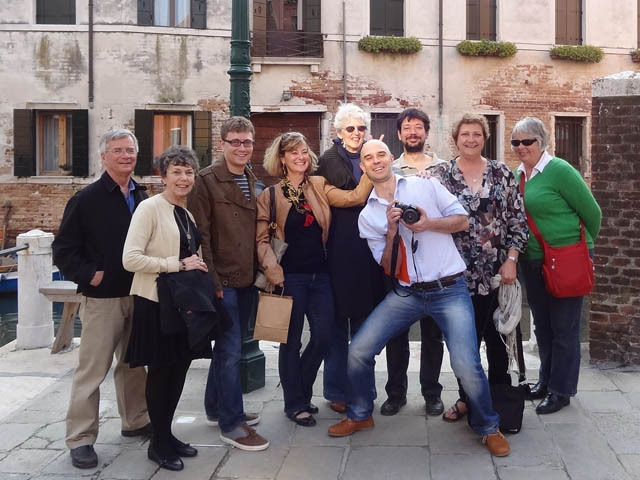 Diego Cattaneo, director of Venice Italian School and I had a wonderful time with our intrepid travelers. I am happy to announce a new Language Cultural Immersion Tour in Italy with the Studentessa Matta. 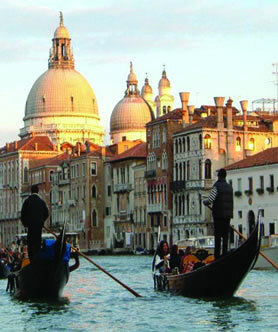 In April of 2013, 7th – 17th we will travel to Venice where we will immerse ourselves in the culture of Venice, while expanding our Italian language skills! 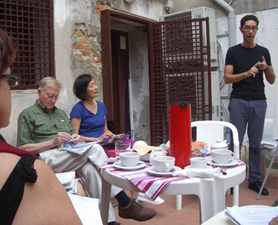 The 2013 Venice Language & Cultural Immersion Tour with the Studentessa Matta is a language experience which will give each participant an opportunity to explore the city, its art and architecture with experienced teachers and guides. 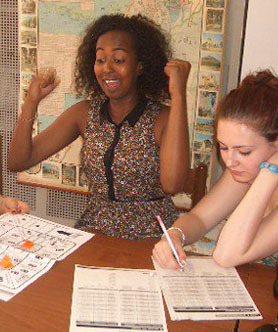 The tour is ideal for both beginners who want to embark on learning Italian while exploring the charms of Venice, as well as for advanced language learners who want to deepen their understanding of the language & polish their conversation skills with friends, family, teachers, guides and local venetians in a warm and friendly environment. Diego Cattaneo of the Venice Italian School has invited me to faciliate a language immersion experience with him at his school in the heart of Venice and I have accepted “volentieri” – gladly! You may recall that I have featured Diego and his school here on the blog before. He has a warm, genuine style and is a dedicated teacher! Students on our tour in Venice are invited to stay for 10 days on Giudecca island at “il Redentore”, a renovated monastery, set on the tranquil island across from Venice, that is equipped with private rooms with individual baths and scenic gardens. During our stay in Venice the mornings will be dedicated to class instruction, lead by qualified and experienced Italian teachers. During the afternoons we will move out into the calle of Venice with our teachers as guides where we will be treated to a cultural activity. We will be cooking saarde in saor a Venetian specialty, learning to row a gondola, learning about glass making, taking part in treasure hunts, as well as living & enjoying the Venetian life style at our own pace during several free afternoons. We encourage both singles & couples of all ages to join us. Diego elaborates: We are offering a language cultural program which is as personalized as it can possibly get and courses are designed for and based on students needs exclusively; moreover, the students will be followed in a personal way throughout their time with us in Venice, inside & outside the classroom, with both language and cultural support, with all activities already organized, maximizing their time in Venice. • 8 Days of Italian language classes with qualified & experienced teachers – 3-1/2 hours each day (2 levels: elementary/intermediate & intermediate/upper level). Tour cost does not include: Airfare, breakfast, lunches or dinners* or transport to/from airport**. (*Please note there is kitchen at our residence that guests may use & a market near by, there are also restaurants on Giudecca island. The final farewell lunch IS INCLUDED. 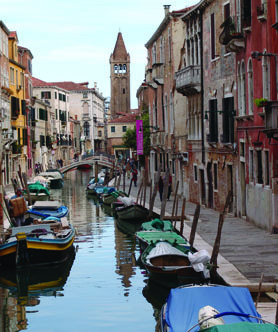 Sunday April 7: Students arrive in Venezia and settle into their rooms at “il Redentore” on the island of Giudecca. Meet Melissa & Diego and share a welcome glass of wine! Transportation cards will be handed out. Wednesday April 10: 9 – 11am: indoor Italian lesson – through speaking activities and games there will be a chance for students and teachers to have a first feedback on language points covered so far and put forward suggestions for forthcoming lessons. Coffee break in the adjacent Campo (30 mins) 11.30 – 1pm: Art lesson (part 1, indoor) – introduction to art vocabulary & afternoon activity. 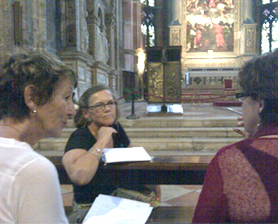 Afternoon 4 – 5.30pm: Art lesson (part 2, outdoor) – “in church” lesson – at the famous Basilica dei Frari: in pairs or small groups, students will carry out activities to practice the use of art-related vocabulary, giving a short presentation of a work of art to another pair/group. Friday April 12: 9 – 11am: indoor lesson Through exercises and role-play students will review the language and grammar learned during the week. Coffee break in the adjacent Campo (30 mins) 11.30 – 1pm: final games with focus very much on conversation Afternoon 4.30-5.30pm: Gondola Lesson – “outdoor” lesson taking place at the local boat club – students will board a real “gondola” with two instructors per boat. 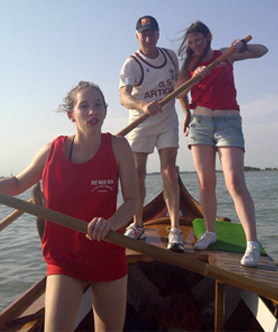 Once reached a calm part of the Northern Lagoon, students will try to take the oar in their own hands, rowing “the Venetian way”, following the instructors’ advice: it does not get more Venetian then this!!! Saturday April 13: Outdoor Lesson: Renting bicycles at the Lido (Venice’s beach) – we will take a gentle ride to the end of the island (about 4 k) where we can have some lunch at a local typical “osteria”; in the afternoon, we will take a quick “battello” (ferry) to the close by island of San Piero in Volta visiting also this fascinating island at the very borders of the Venetian Lagoon. Monday April 15: 9 – 12pm – indoor lesson: Review language progress & lessons and activities done during the week – final games and role play with focus on conversation. 12pm – afternoon: visit to the island of Murano with a practical demonstration of glass working by a local artisan. For the students who are interested, there will also be a chance to create a small object by themselves, under the guidance of a local artisan. Tuesday April 16: Boat outing to the island of Burano – final-day visit to the famous islands of Burano with lunch at the local restaurant. Cara Melissa, siamo sorelle in the teaching of Italian. Sono Luisa, and for the past 2 years a group of Aussie students and I have enjoyed a wonderful Italian learning programme with VIS. la Bellissima Venezia is a place I love to stay at. I do not have a webpage yet, but you can follow me on Facebook : venicewithluisa if you like. Yours, in the passion for Italian..